Dated 1956, extended 1976, closed 1999. Single storey, flat-roofed radio station with 2-stage operating room comprising battered polygonal ribbon window in style of airport control tower. Red brick base course. Dry-dash with raised ashlar doorway and concrete cills. S (OPERATING ROOM) ELEVATION: polygonal elevation with vertically-aligned multi-pane window wrapping around end of building, much reduced set-back polygonal 2nd stage also glazed. W (ENTRANCE) ELEVATION: 10-bay elevation (bays grouped 1-9). Symmetrical bays to right with broad 2-leaf timber door and fanlight at centre, regularly-disposed windows in flanking bays; advanced outer left bay with further door, large cowl air vent and datestone with crown and '1956' in high relief. E ELEVATION: advanced bays to left comprising lower bay to outer left with 2 broad full-height windows and bay to right with horizontal row of small lights close to wallhead. Set-back bays to right with raised boiler room roof. Top-opening and fixed timber windows. Concrete roof. INTERIOR: operating room remains with timber and glass partitioned inner room reflecting polygonal outer viewing area; part- glazed paired swing door and deep plate glass fanlight to main entrance; glass brick roof lights and reinforced sliding metal door to boiler room. Surrounded by a ring of masts and sited high above the sea close to the ruins of Dunnottar Castle, Stonehaven Coastal Radio Station is a rare survivor. The service was operated by Post Office Telephones and subsequently British Telecom. It was associated with Merchant Navies, initially co-ordinating Search and Rescue operations between Coastguard and the RNLI. The first coastal Radio Station in the Stonehaven area was built circa 1910. With commencement of hostilities in WWII, coverage of the North Sea from Cullercoats and Wick was found to be limited. This resulted in the Admiralty building a station, opened in May 1942 and comprising an assortment of small wooden huts. 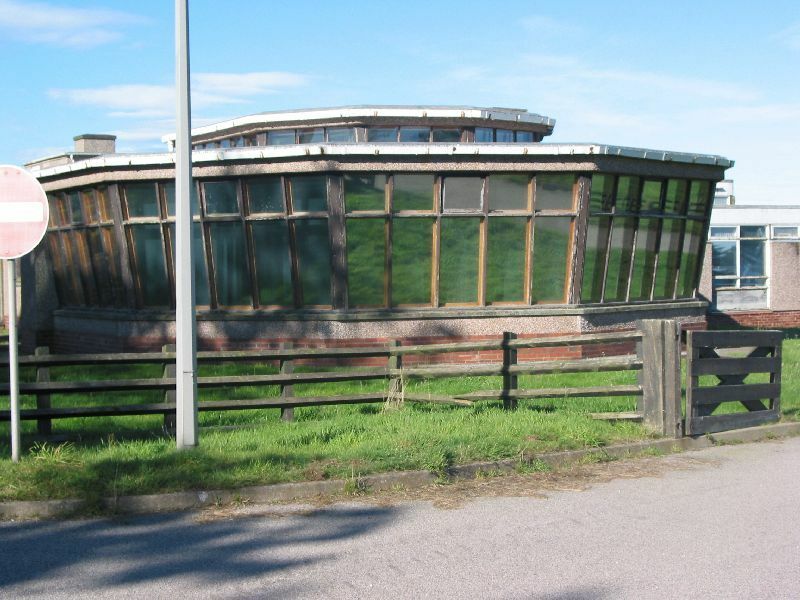 Today's modern Radio Station (see above), built to a plan soon to be repeated at Ilfracombe in Devon, was opened in January 1958 by the Inspector of Wireless Telegraphy. With the discovery of North Sea Oil in the mid 1960s special services were needed for oil companies and support vessels. By 1966 the station operated a 12-channel radiotelex system (shared with Humber) enabling rigs to work direct with company offices. By 1972, half of the station's 17,000 calls per year were made by exploration platforms. Throughout the 1980s control of services from other stations were transferred to Stonehaven, but technical advances and the introduction of VHF direct calling in 1986 led to the closure of Stonehaven's distress watch on 31st October, 1987. During the 1988 Piper Alpha disaster the station was heavily involved in handling back-up communications between rescue and support vessels. The introduction of Maritime Satellite systems led to the Coastal Radio Network ceasing operation in 1999.